The term, “Keratoconus” refers to an eye condition involving the cornea, the clear window at the front of the eye, thinning and warping into a cone-like bulge. 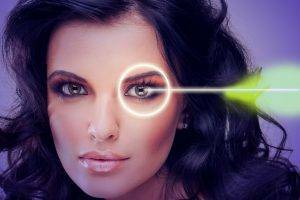 This condition can do a great deal of harm to your vision. Normally the cornea maintains a curved, dome-like shape. This allows the cornea to refract light onto the back of the eye, in such a way that it creates a clear image to send to the brain where it is interpreted. When the cornea takes on a more conical shape, this scatters the light as it comes in, sending light to several different points on the retina, creating blurring of vision, distortion of vision, increased sensitivity to light, glare and mild eye irritation. Dr. NAME of PRACTICE in CITY is happy to be your go-to doctor for this and all other eye care needs. For questions and more information, contact Dr. George K. Johnson today.